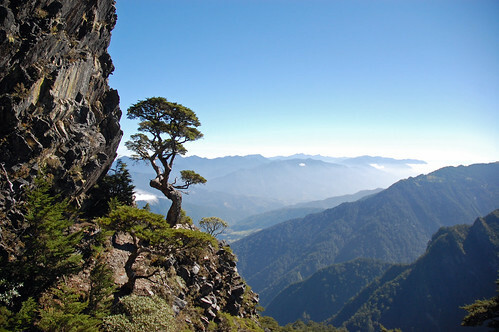 The Sixiu or ‘four shows’ are located at the northern end of Wuling Farm and are made up of four mountains, Taoshan, Kelayeshan, Chiyoushan and Pintianshan. This group of mountains aren’t as famous as the neighbouring Snow Mountain or Dabajianshan which is great for getting away from the crowds and actually getting a weekend permit! Typically if you’re hoping to climb all four mountains then 3 days are needed, but as we only had the weekend we decided to do the western half and bag Chiyou and Pintian. There are two trails that take you up to the Sixiu and both are on the Taoshan Waterfall path. 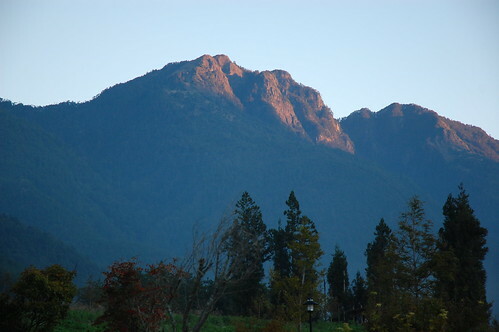 The trail to Taoshan (the mountain) starts around the 1.5k mark and the Chiyoushan trails starts at the 3.5k. Both trails are incredibly steep and hard work. 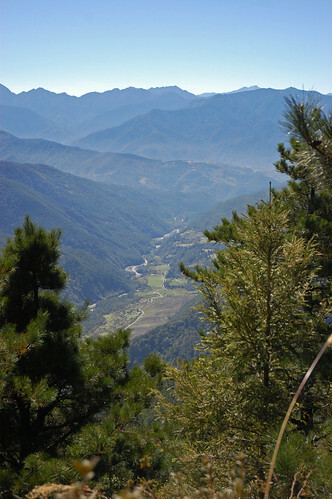 The Taoshan trail is a mere 4.5km long but climbs some 1400m. 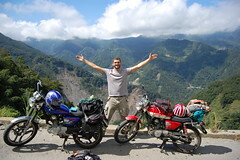 It took the best part of the morning for us to drag ourselves up the Sancha Campsite just below Chiyoushan. Some of us were ill, some a little hungover and some suffering the effects of altitude meaning that we were quite done in by this point. For me, it was the first time in a long time to really feel the altitude and I was grateful for a good rest. 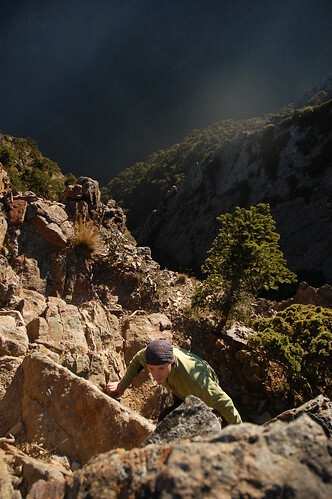 At the campsite there is a fork in the path with a right going to Taoshan (a beautiful ridge walk) and left leading to a boulder slope which marks the beginning of the final ascent to Chiyoushan. The slope was created by freeze-thaw action in the wintertime and is quite treacherous to walk on. 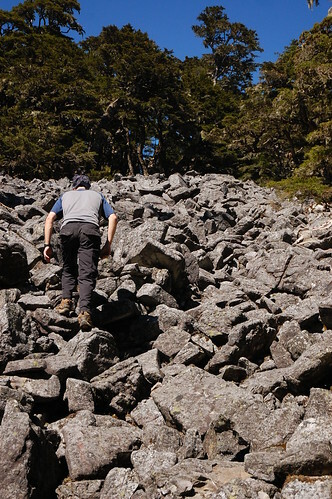 Even the largest boulders are loose and move as you step on them! At the slope, we gladly dropped packs and started the climb up it. It’s a strange feeling to not have that weight on your back. Something like what I imagine astronauts feel like when walk on the moon. You get so used to pushing harder with each step that once the pack is off, you still push too hard and almost jump into the air! Nearing the top of the slope, the path shifts over to the left and then climbs up to an enormous cliff-face with awesome views of Dabajianshan. We then skirted around the edge of the cliff and climbed a little further to get to the top of Chiyoushan (3303m). From the peak you can continue down to rejoin the path but as we’d dropped packs, we headed back the boulder slope to collect them. Looking at the map we were anticipating a nice, flat, gentle walk to the Xinda Cabin, but much to our disappointment, the trail kept climbing steeply up, then steeply down and so on. The scenery continued to be very impressive but we were beginning to tire so much that it was difficult to really appreciate it. Finally at around 2, we made it to the cabin. Despite being totally knackered, we decided that rather than sit around the cabin, we’d make a go for Pintian that afternoon. 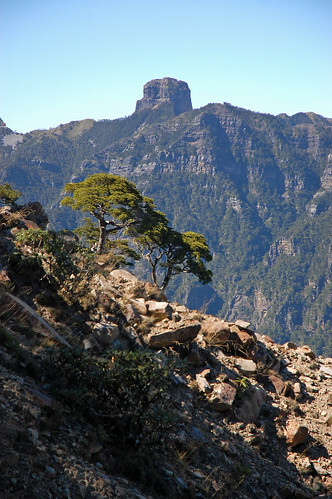 It’s a great walk to the top of Pintian. 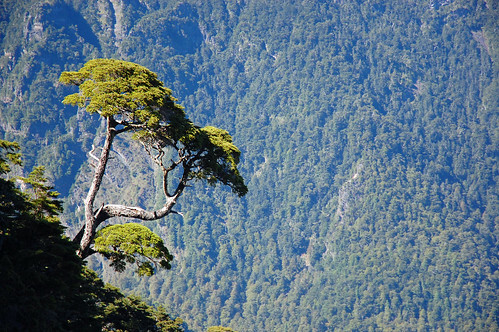 The Chinese hemlock of earlier gives way to grass plains with wonderful views. We had thought that we’d seen the peak of Pintian earlier in the day but we were wrong. After reaching a false peak, there is a rather hairy descent and climb to get to Pintian proper making glad we hadn’t tried to get there for sunrise the following day. Scrambling on those rock faces with only headlamps lighting the way would have been very scary! After sitting on the peak for a while, we headed back to cabin to get set up for the night. We stuck to our original plan of camping despite there being spaces in the cabin – too many people wanting to start at silly o’clock the next day was enough to put us off and we figured the campsite being 200 yards from the cabin might give a better chance of a decent night’s sleep. As soon as the sun was down, the temperature dropped and after eating we were in the sleeping bags by 7. 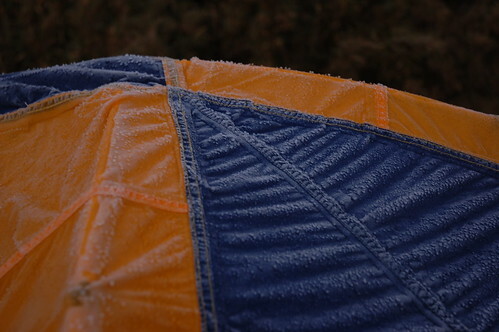 Night got even colder and by morning, our tents were covered in ice and our drinking water was frozen. After watching a spectacular sunrise, we got packed up and headed back down the way we came up. There had been talk of making a dash for Taoshan but we were well knackered from the previous day’s hike and were ready to head back home. 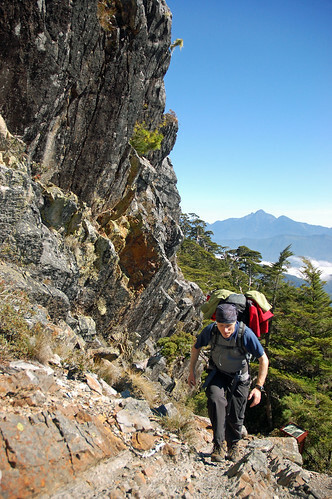 If you’re interested in hiking the Sixiu or any other hikes in the Sheipa National Park, contact us at Taiwan Adventures. 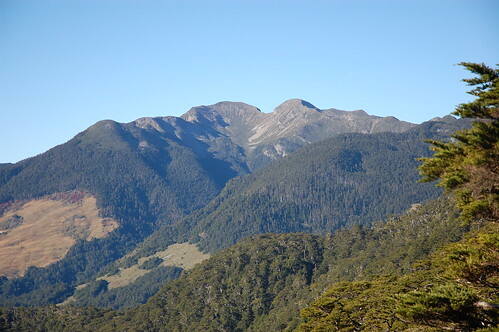 Permits – You need both a park and mountain entry permit for this hike. Get the park entry first from the Shei Pa National Park. The mountain permit can then be applied for with the National Police Agency or you can do it on the spot at the Wuling Farm Police Station. Be sure to check in and out with them before and after hiking. If you can’t read/write Chinese completing the permit application can be very difficult. Barking Deer can help out in that respect and they also run orgainsed trips to this area too. 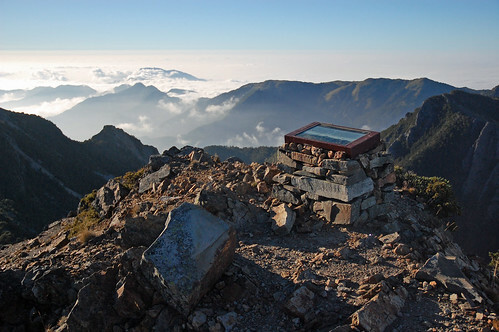 Cabins – There are 2 small cabins, Xinda (between Chiyou and Pintian) and Taoshan (just below the peak of Taoshan). Both have water sources but check with the police before heading up. In winter, the tanks can freeze and if there hasn’t been any rain for a while the tank maybe empty. Near to both cabins there is some space for tents. Wuling Farm – There is an entrance fee, but it seems that if you turn up late, there’s no one there to collect it! There are hotels to stay at however they are quite expensive. The much cheaper and more basic Wuling Villa which is conveniently located at the trailhead for this hike, has been undergoing renovations lately and will be run by the same company as the other hotels at Wuling. Hopefully when it opens, the price won’t change much. Alternatively, there is a great campsite on the road that leads the trailhead for Snow Mountain. There are toilets and showers as well as space for parking. Again, if you turn up too late, no one wants to take any money from you. Even if you go looking for them! AWESOME photos and report Stu. Thanks, no plans to get out to the high mountains soon? Hi I am planning to come to Tajwan in around March for around 3 weeks. Your website is quite helpfull to me lately. Can you tell me if this tour, you mention here, can be done around March, or there would be snow, which would make it too difficult? I love your blog! Its wonderful. I am from Austria and now studying in Hongkong. 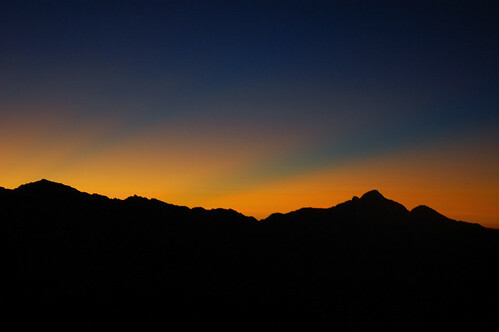 I am planning for end of Mai / June a hiking trip through Taiwan. Can I write you an e-mail for some further questions? Also about wather conditions? wow, another great review of another awesome hike. keep it up! Ditto…another great hike and pics! Glad it’s useful to you! hey, I realize that you guys bring cameras onto trips. I have a Canon Rebel T1i but don’t really know my options for carrying them onto camping/hiking trips. I’m thinking about a chest pack (maybe from Mountainsmith? ), any suggestion will be much appreciated. thanks again, keep up the great work! I usually just carry the camera slung over one shoulder and put the camera bag in my backpack. My friend, Neil, carries a bag that hangs in front, but has to have some extra clips to get the bag to sit well. hi. I was loooking for a way to contact the writer of this (great) blog. I have a question he may be able to answer. However I do not see an email address.. anyone know how? I am trying to find a trailhead on the west side to access the Wuling Sixiu trail or ascend Mount Pintian. 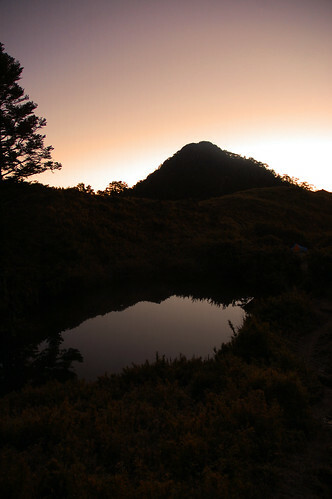 Basically I will be in Hsinchu and have a full day to go trail running/climbing. Would you please advise. Hi, what time of year was your trip. And do you have any good sources for mountain weather forecast and monthly averages?